Media captionThe Duke and Duchess of Cambridge emerge from St Mary’s in London with their newborn prince. 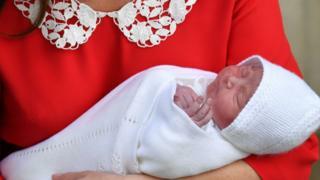 The couple’s second son, who was born at 11:01 BST, weighing 8lb 7oz, is fifth in line to the throne. Prince George and Princess Charlotte had visited their brother at the Lindo Wing of St Mary’s Hospital, London. 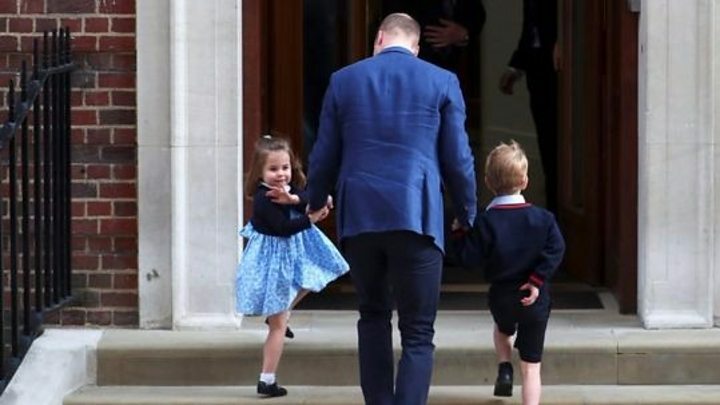 Leaving the hospital Prince William said the couple were very happy, before holding up three fingers and joking he had “thrice the worry now”. “We didn’t keep you waiting too long this time,” he added. Minutes earlier, Prince William and Catherine had come out of the hospital briefly to greet the crowds with their new son. They then returned inside to put their newborn son in his car seat before driving away towards their home Kensington Palace. The duchess wore a red Jenny Packham dress with a white collar as she left the hospital. 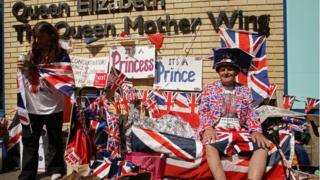 Fashion commentators said that its colours reflected St George’s flag, while others saw echoes of Princess Diana, who wore red and white when she left hospital with a newborn Prince Harry in 1984. Members of both families have said they are “delighted with the news” of the birth. Kensington Palace said the name of the baby would be announced in due course while a formal notice of the birth had been posted on the forecourt of Buckingham Palace. Favourite names at the bookmakers include Arthur, Albert, Frederick, James and Philip. Prime Minister Theresa May tweeted her “warmest congratulations” to William and Catherine. What might the new prince be called? What is it like growing up as a third child? The Archbishop of Canterbury added: “Congratulations to The Duke and Duchess of Cambridge on the safe delivery of their baby, a brother for Prince George and Princess Charlotte. 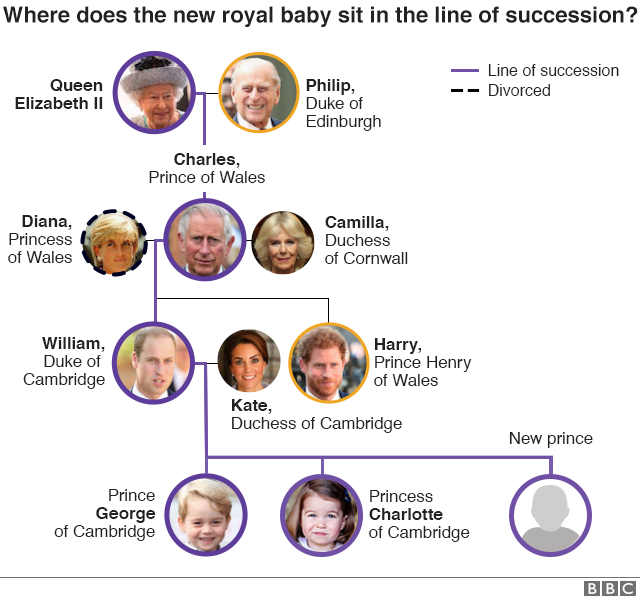 After some quieter times, the Royal Family is back in the news – and there is a noticeable sense of renewal; new faces, with Meghan Markle, Prince Harry’s fiancee, making her first public appearances, and now another child, the as-yet unnamed third child of Duke and Duchess of Cambridge. It’s always gone like this – waves of interest followed by periods of relative quiet. But there has been a sense of renewal in the past few months. 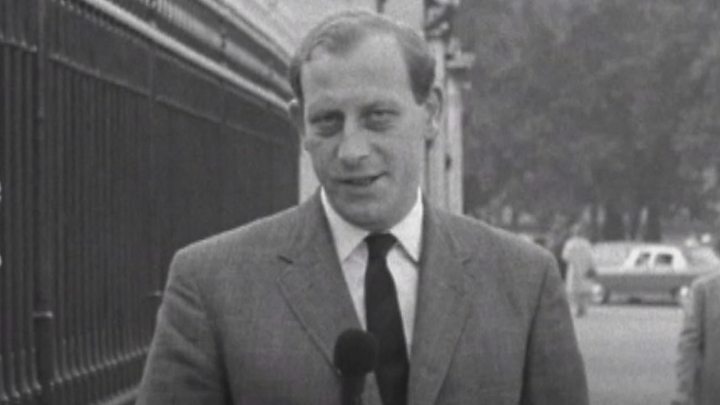 Of course there has been concern over the health of the Duke of Edinburgh; and interest in the Queen, with her decades of service, never falters. But the attention of a new group, both in Britain and around the world, has been caught by this birth and then the wedding of Prince Harry and Meghan Markle next month. 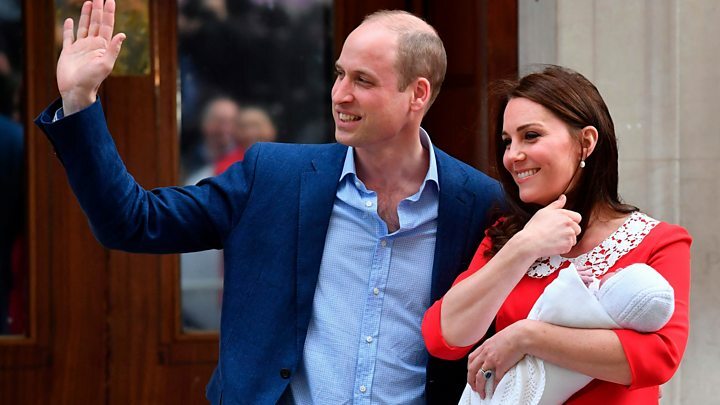 From the darkest days of the World War Two to the Instagram generation, the Royal Family now connects them all. Following a change in the law in 2013, Princess Charlotte keeps her place as fourth in line to the throne. Previously, younger royal males would have taken precedence over older female siblings. The duchess was admitted to hospital shortly before 06:00 on Monday with the announcement of the birth coming shortly after 13:00. The new prince, born on St George’s Day, shares a birthday with Lady Gabriella Windsor – the daughter of Prince and Princess Michael of Kent, who was born at the Lindo Wing on 23 April 1981. Will the new prince be king? To become King or Queen as the third-born royal child is rare – and has yet to happen within the current House of Windsor. But the third child of George III and Queen Charlotte, William IV, took on the task and ruled from 1830 to 1837. The Hanoverian king acceded to the throne aged 64 when his older brother, George IV, died without an heir. He became next in line when he was 62 and his other older brother, Frederick, Duke of York, died. Have you, or has anyone in your family, had a baby today? Please email haveyoursay@bbc.co.uk.